Minutes is a timer application. 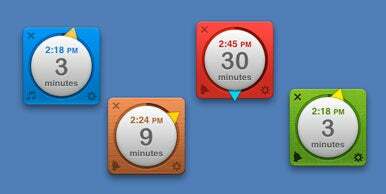 Each timer is its own window, with the time remaining for the timer and the time it will go off. The timer will either play a built-in sound, start an iTunes playlist of your choosing, or stop iTunes from playing. You can't choose the sound it uses and you only get audible feedback, unless you count the short window shake it does. Timer control is straightforward. You create a new timer and choose the length of a timer from a menu (or use the keyboard shortcuts provided). Unfortunately, you can't type in a custom length or time of day. In order to achieve that, you must use the triangle control on the window and drag it around until the desired delay is set. Each timer can have its own appearance, but you can't specify your own colors and only four options are available: Keynote (a brown wood grain), Picnic (a green thatched look), Concert (a simple red), and Halftime (a simple blue). You can choose to make a timer float above other windows even when in the background. Minutes doesn't play nicely with Spaces however. While you can drag the timer windows around, attempting to relocate windows to another Space will fail when doing so. As a simple countdown timer, Minutes performs perfectly. While the triangle drag control is effective, the ability to type in times is missed. The built-in appearance options look great, but more customization or options would help identify the different timers (particularly because they lack the ability to specify label text). Timer expiration options are also an area that could stand further expansion. Dialogs or Growl alerts with user specified text would be welcome additions. If Minutes simple approach and limited options are what you're looking for in a timer application, it's a beautiful, inexpensive choice.